The kitchen is widely regarded by interior designers as the most important room in the home. As a focal point of family life and entertaining, the kitchen says a lot about the owners and helps set the overall theme of the home. Kitchens should be welcoming and beg to be sat in, used and enjoyed. One of the most popular custom kitchen designs that speaks to all of the above is the farmhouse kitchen. Rustic, charming and built for utility, the farmhouse kitchen is a great addition to any traditional or modern home. 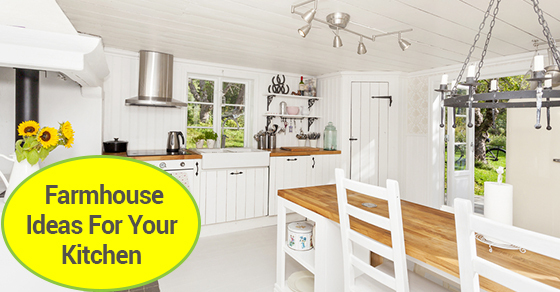 Below are some great farmhouse ideas for your kitchen. One thing that nearly all farmhouse kitchens have in common is their use of all-white cabinetry. White cabinetry speaks of simplicity and brings out the rustic charm in the rest of the elements of your farmhouse kitchen. The main feature of a farmhouse sink is that it is big, open and comes with an “apron.” Farmhouse sinks are reminiscent of a time when sinks were used for canning, cooking, cleaning and even washing babies. Farmhouses obviously didn’t have dishwashers, so the sinks were both wide and deep for easy washing of pots, pans and other large kitchen items. These three materials are widely recognized for being able to make the farmhouse custom kitchen design come to life. They are typically great contrasts to the all-white cabinetry scheme, are easy to clean, and maintain and add a warmth to the kitchen that is typical of the farmhouse style. Nothing says farmhouse charm like classic beadboard design. Beadboard panels make it look like each individual plank of wood was laid by hand in that traditional farmhouse style. Custom kitchen design values beadboard for its ability to create a rustic look and feel, while using modern design and efficiency. Big glass canisters and mason jars instantly take one back to simpler times, and can be used for storing just about everything, including pasta, legumes, candy and spices. Pretty much any cooking staples can be kept in mason jars and left beside the oven, sink or stove to create a “ready to use” feel that will complement the farmhouse aesthetic of any custom kitchen design. Creating the farmhouse look and feel for your kitchen is really quite easy when you know how to bring the theme together with a few simple touches. Adding some down-home feel to your kitchen, whether in your home or at a vacation property, will make the act of eating and gathering that much more memorable and heartfelt.